Okay, so I am sure someone out there has done this already, but here’s the concept and maybe others can improve upon it. 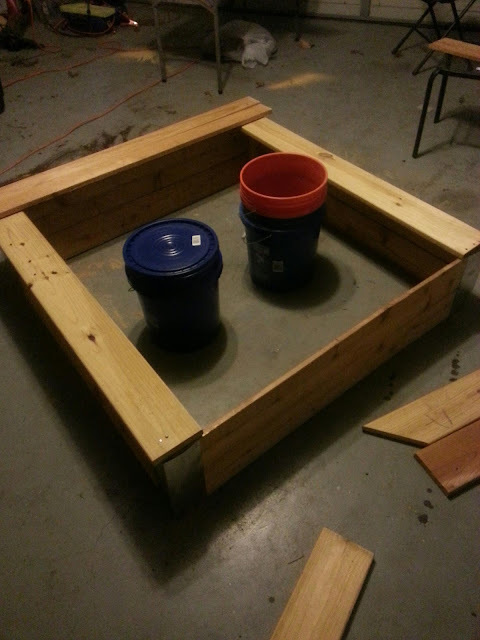 It begins with a 4’*4′ cedar raised bed, and four food grade buckets, with two lids. I drilled two different sizes of holes in the buckets. Two had very large, inch holes. Two had very small drainage holes. The big holed buckets go inside the small holed buckets. I put holes around the sides and bottom where the soil line inside the raised bed would cover the holes. 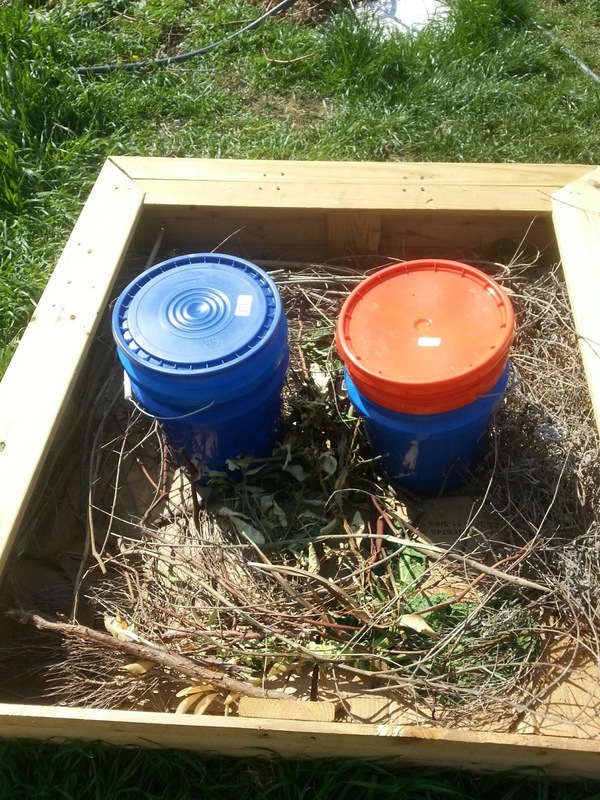 Two small bricks go inside and at the bottom of the small-holed bucket, to keep the larger bucket from getting stuck inside, and to promote drainage out of the upper bucket. The raised bed went out with a cardboard weed barrier, and hugulkultur style logs and sticks, manure, composed at various stages of decay, and other organic bits and bobs such that the buckets are surrounded by hugulkultur-style garden bed. The soil goes on top of all this, and a light mulch on top of that. 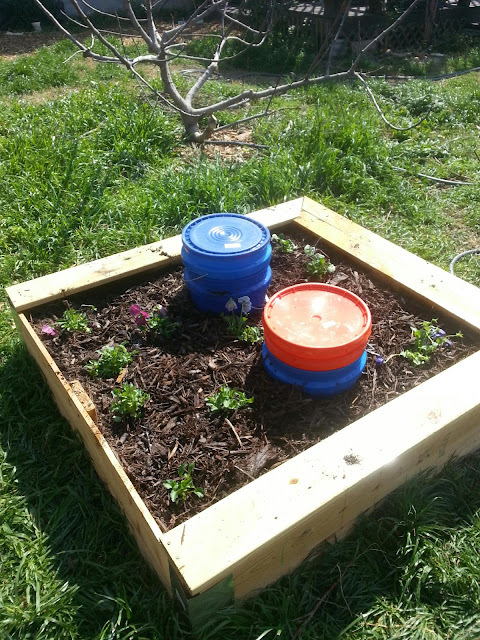 So… The buckets will have bokashi composting going in them. 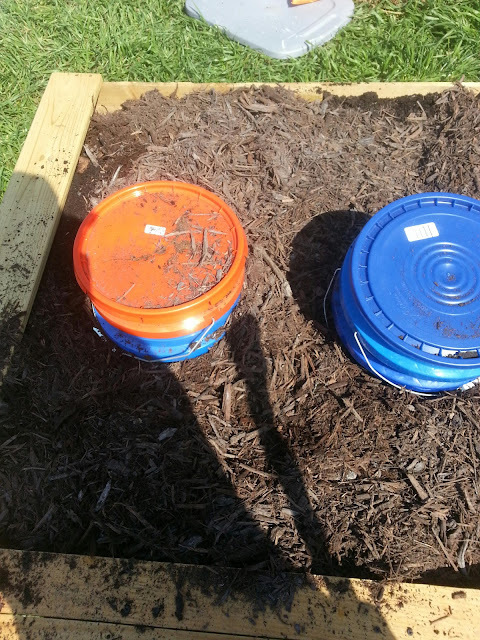 It is an activated composting method that happens much faster than others. The compost buckets can be picked up and pulled out and the compost can be easily placed elsewhere in the garden. As well, the buckets can be washed as needed. 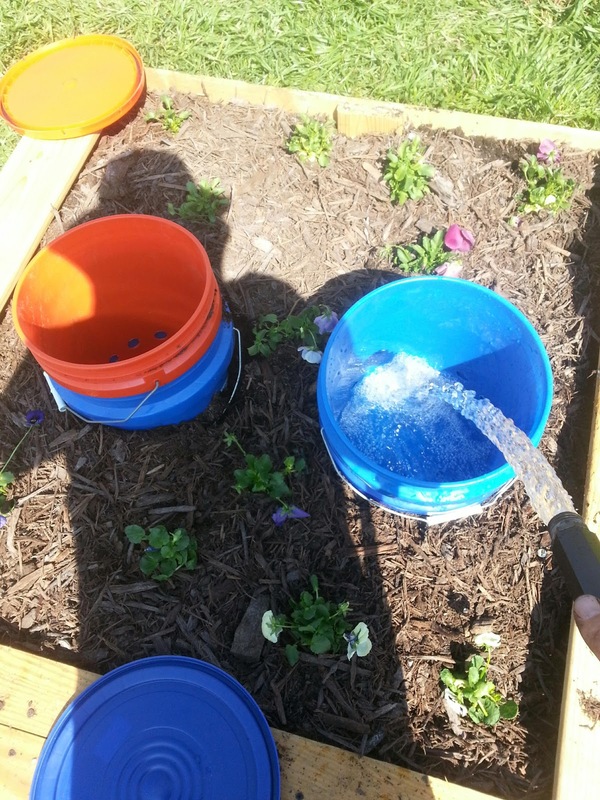 To water the raised bed around the buckets, just fill the buckets with water. They will leak out through the compost, which should, in theory, always be leaking out into the hugulkultur sponge-like organic matter layer. I put pansies in just to start, to let the dirt and sticks and things settle down. Soon, I will plant actual vegetables in there, and we shall see what happens, if this idea works. It is sort of a hybrid of ideas of hugulkuktur, clay oalla pots, keyhole gardening, and bokashi, along with a compost system that is easy to maneuver to a different location than just the one raised bed. I hope I am a genius, but I am sure that I woll discover challenges as I go that I could not have anticipated. We shall see. Anybody have any ideas of what I can do to improve the design?